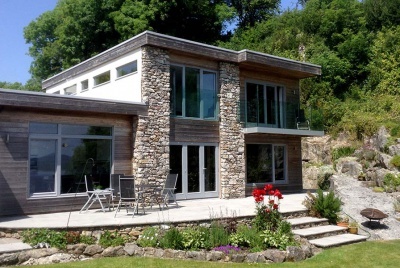 Lakeland Timber Frame offer a flexible, personal service for construction and architectural professionals and to individuals for self-build projects. 140mm timber frame with a loose roof & solid joists. Lakeland Timber Frame is a well established timber frame manufacturer offering a flexible, personal, nationwide service for construction and architectural professionals and to individuals for self-build projects. Their purpose is to engineer, manufacture and construct timber frames to individual design, in a range of settings, for a variety of purposes. Every project they undertake is unique, they work with their customers to create their dream home. They combine high quality craftsmanship and attention to detail, using timber from sustainable sources, with the latest developments in technology to provide timber framed homes and buildings for the twenty-first century. Contact Lakeland Timber Frame to find out how they can offer you practical, value for money timber frame construction solutions to suit your project, your budget and your aspirations. They can tailor their supply to your requirements and the requirements of the particular project – whether that is current Building Regulations standard, low carbon, zero carbon, Code for Sustainable Homes, Passivhaus or any other standard. Please send your drawings for a free no obligation estimate. We welcome enquiries from all types of prospective client, including self-build, builder, main contractor, architect, housing association and many others.